Titration of Prestained Protein Marker, Broad Range (11-190 kDa) #13953 (left). Western blot analysis of #13953 using Anti-Blue (2DF11) Mouse mAb (HRP Conjugate) #46387 (right). 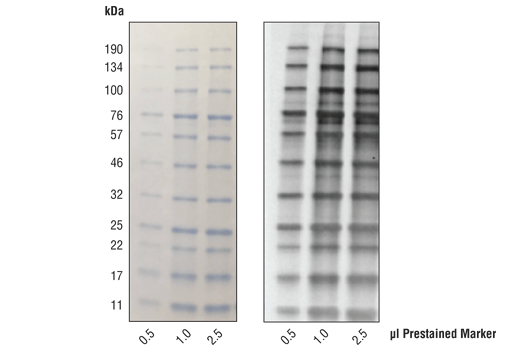 Prestained Protein Marker, Broad Range (11-190 kDa) is a mixture of purified proteins covalently coupled to a blue dye that resolve to a series of 11 bands between 11 and 190 kDa following electrophoresis. The protein concentrations are carefully balanced for even intensity. The covalent coupling of the dye to the proteins affects their electrophoretic behavior in SDS-PAGE gels relative to unstained proteins. 1. Thaw the protein ladder on ice. 2. Gently vortex solution to ensure the mixture is homogeneous. Please note, when using #13953 Prestained Protein Marker, Broad Range (11-190 kDa) with #46386 Anti-Blue (2D2F11) Mouse mAb (HRP Conjugate), it is recommended to load between 0.5ul-2.5ul of #13953 to better visualize the separation of proteins while minimizing excess background due to an overabundance of protein. 4. Unused ladder may be returned to -20ºC for long-term storage. The relative sizes of these protein markers may depend on the type of gel used and may appear different than expected. The coupling of a charged dye molecule to a protein marker alters the overall charge of the protein and will likely alter its mobility in an SDS polyacrylamide gel. The extent of this effect can vary with the properties of the gel type (e.g., Tris-glycine, Tris-Tricine, etc) used in the analysis. For this reason, the sizes of these marker proteins are expressed here as apparent molecular weights. For best results, we recommend using these prestained protein markers on a Tris-glycine SDS gel. Supplied in 20 mM Tris-phosphate (pH 7.5 at 25ºC), 3.6 M Urea, 2% (w/v) SDS, 0.2 mM DTT, and 15% glycerol. Store at -20ºC. Contains approximately 0.2 mg/ml of each protein.